It’s a bit of a standing joke among the other mums that I have my hands full with Charley and most of the time I really do as the only way to get to school quicker than a snail is to carry her. My beautiful little cherub is build of solid meat and weights a tonne so my poor back is sore by the time we have done this backwards and forwards 10 times a week. I have tried using a backpack harness on Charley so at least I have control on her as we walk from the car to school each day, but madam is not happy to have any type of restraints on her. So with every problem, so must a solution arise and in this case, it came in the shape of a Micro Trike. It may look like a mini golf trolley but this little gem has been the answer to my prayers. So light it weights less than ½ bag of sugar and it’s slimline design means I can easily fold it totally flat and stick it in the boot within seconds. 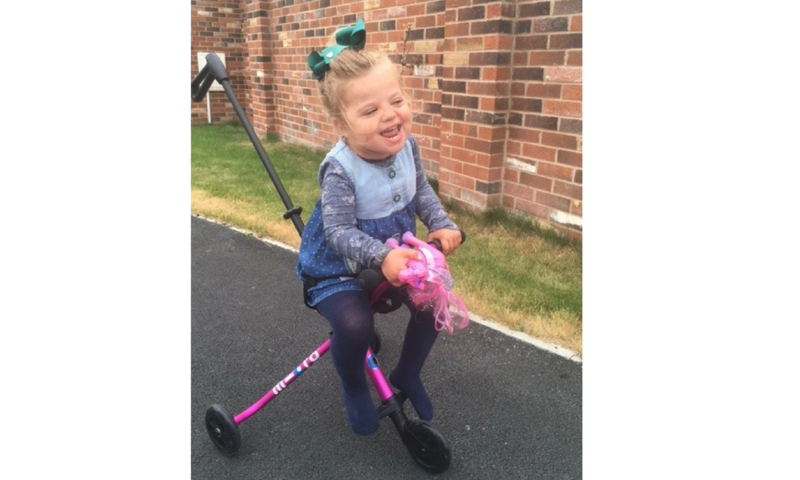 The simplicity of the Micro Trike is the key to making this product so successful. Charley sit’s on, I quickly clip her into the safety belt and we are off. The Micro Trike is easy to maneuver with one hand so when you need to cross roads your other hand is free for guiding any siblings across with you. The most important thing is Charley loves riding on it and It’s turning my very stressful school runs into a breeze. The Micro Trike is going to be a very welcome addition to our family. 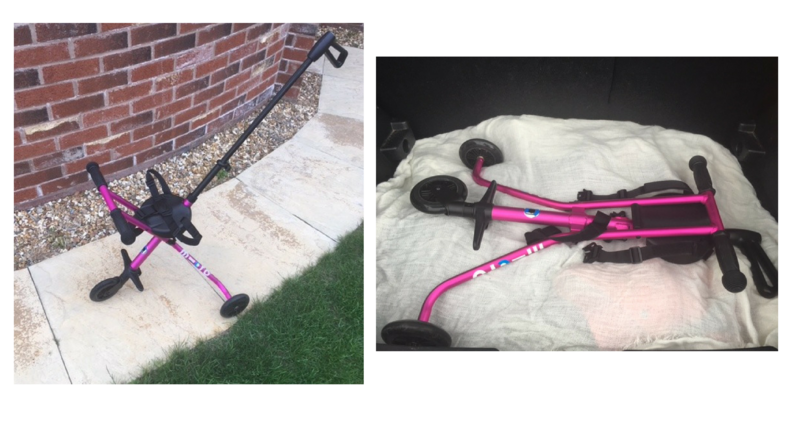 For the first time in nearly 3 years, I have removed our Bugaboo pram out of the car boot and replaced it with the Micro Trike. 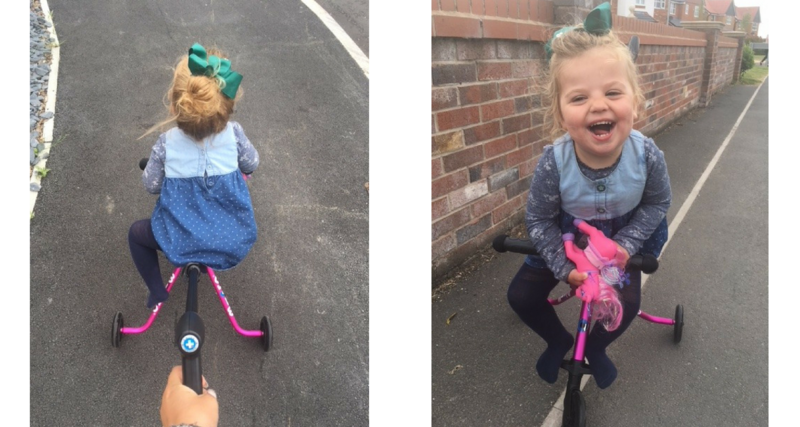 If you are interested in making your school run a breeze you can purchase the Micro Trike directly from their website or through the Amazon link below for an RRP of £74.95. Colours available at the moment are blue, pink, white & black but I am sure more colours will be available soon. The Micro Trike was kindly gifted to us for the purpose of review, but all my thoughts & opinions are my own. "It’s Exhausting Constantly Chasing Your Dreams."